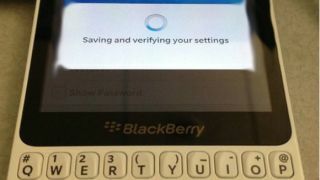 A sneaky picture of a new BlackBerry device has surfaced online, giving us a peek at what is seems to be a Curve-like model for BB10. Popping up over at BlackBerryOS, the poster claims that this model is from a new R-series, and comes with a big ol' QWERTY keyboard. We can also seen some not-very-exciting activity happening on the screen. The Curve series has been a popular one of BlackBerry's and it's obviously keen to keep the momentum going - and answer the please of those still crying out for a physical keyboard. BlackBerry's QWERTY Q10 has only just gone up for pre-order in the UK, but it looks like keyboard fans still have another on its way that will be a successor in the Curve series. At the same time, BlackBerry Empire has posted a sketch of what is supposedly the same device, claiming that it will have 8GB of internal memory and a 1800mAh battery. It'll also be priced between $300 (£196, AUS$290) and $400 (£260, AUS$385) to put it at the entry-level end of the spectrum.